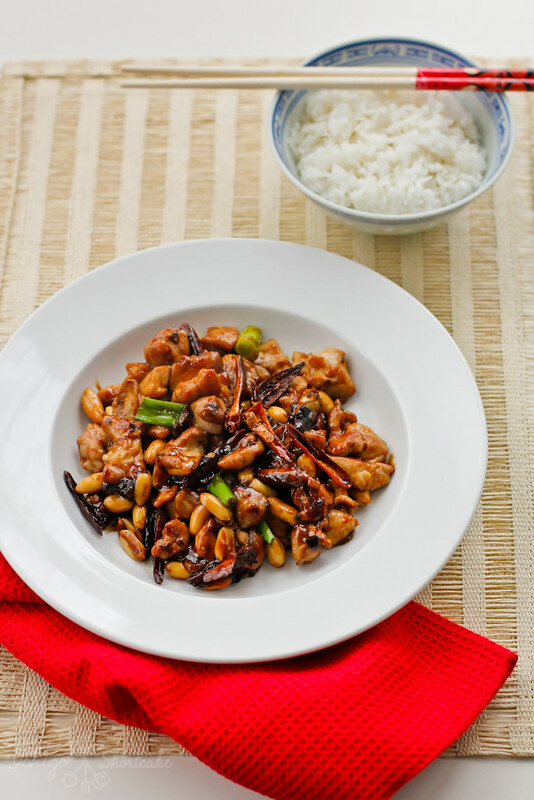 Kung pao chicken or Gong Bao Ji Ding (宫保鸡丁) in Chinese is a famous dish from the Sichuan Province of China. There are many stories about its origin but one of the more widely accepted is the following. 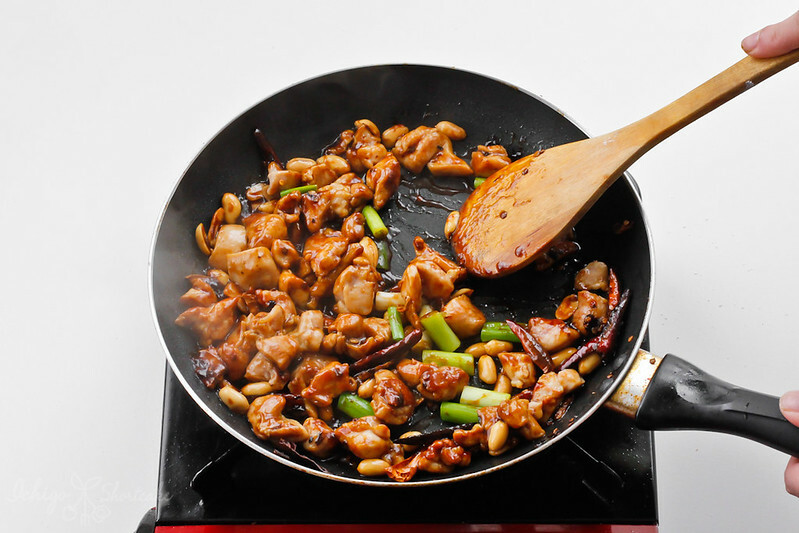 There once was a governor of the Sichuan province in the Qing Dynasty called Ding Baozhen who loved to eat stirfry dishes made with chilli and chicken. Whenever he held parties, the stirfry dish with peanuts, chicken and dried chilli was always the star of the dining table and was highly loved by all his guests. Over time, the dish was given a name using part of the governor’s name and became Gong Bao Ji Ding. I know I’m not famous, but it would be great if a dish I invented or loved was subsequently named after me and eaten by millions around the world. I bet at the time, he had no idea this dish would even become popular around the country let alone around the world! 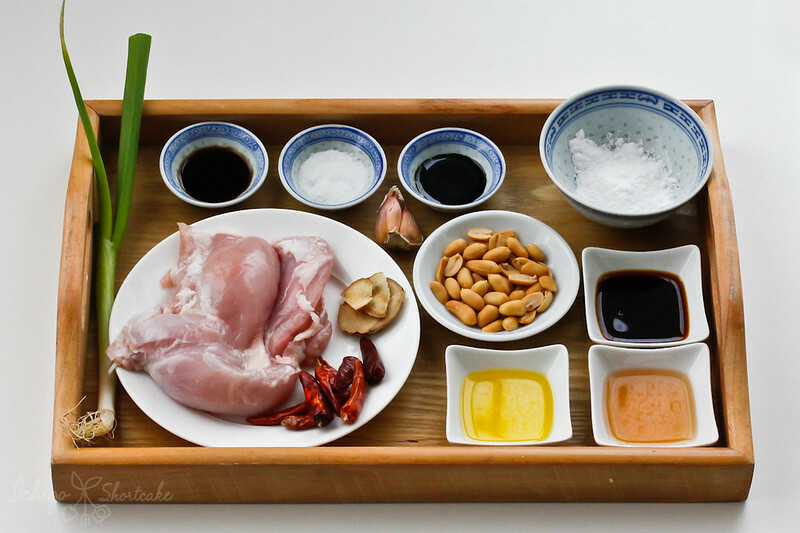 I do understand the popularity though since it really is quite a delicious dish, full of spices, tender chicken and aromatic peanuts that will make you reach for it spoon after spoon. Okay, enough of me talking about the dish, here is the recipe! Hope you like it as much as we do. 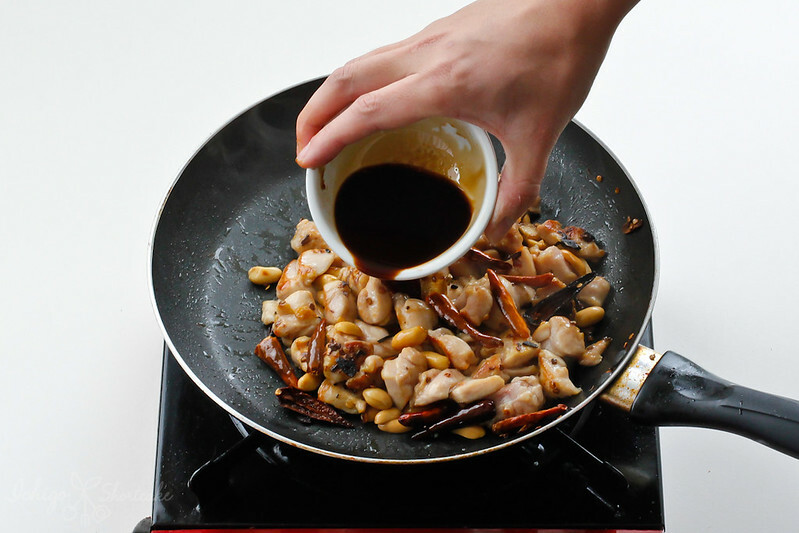 A fiery chicken stir-fry with a spicy and tangy sauce along with crisp peanuts. Cut chicken into 1.5cm cubes. Thinly slice ginger. Finely chop garlic. Cut spring onion into 2cm long segments. Mix 1/2 tbsp cornflour and rice wine with chicken and lightly season with salt. Let it sit for 10 min. 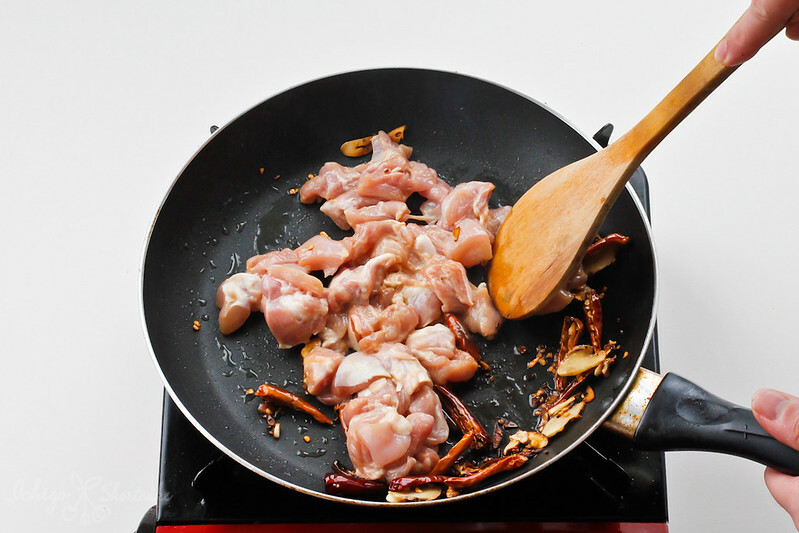 Increase heat to medium high and add chicken, frying for about 3 min or until just cooked through. Add peanuts, soy sauces, vinegar and sugar. Reduce heat to medium and cook for 2 min. Dissolve remaining cornflour in a little water and add to chicken along with spring onion. Cook for about 2 more minutes and remove from heat. Put onto a plate and serve immediately with rice. 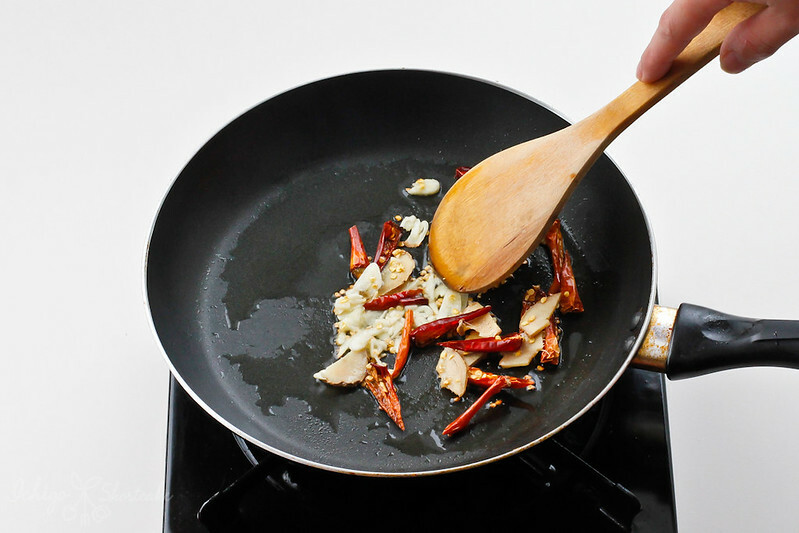 Have adequate ventilation as frying chilli creates fumes which may irritate. If using salted peanuts, make sure to adjust seasoning accordingly. Cashews can be used instead of peanuts. Scrumptious! My kind of stir-fry.